The Lotus Elite Mark 2 sports car. With the onset of the 1970's, Colin Chapman decided to move the brand up market, and to phase out the availability of kit car versions which he felt were no longer in character with the image of the company. Accordingly, the Elite was designed to include all current and projected safety regulations and, although the body was made from glassfibre, it would be both strong and rigid. In terms of its styling, the majority of the work was performed in house, although the designer Giugiario, best known for his design of the Morris Ital saloon, made useful suggestions. In fact, the Elite was the first of three models involved in the re-branding, the other two being the front-engined Eclat, and the mid-engined Esprit. 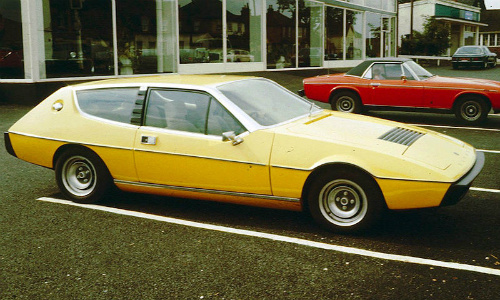 The Elite Mark 2 Type 75 sports car was launched in 1975, and was Lotus' first saloon car, styled as a luxury four seater hatchback. It had a fibreglass bodyshell fitted to a steel chassis, as used in the Europa and Elan. It was front-engined, and powered by Lotus's own 1973 cc, 16 valve, all alloy, twin overhead cam, Lotus 907 engine (originally used in the 1971 Jensen Healey convertible), developing 155 bhp (140 bhp for the US export model). It used Dell'Orto carburettors, and was fitted to Lotus's own five speed gearbox, as used in the Austin Maxi saloon. It had a 0-60 mph time of 7.8 secs, and a 0-100 mph time of 25 secs. Initial press reaction was that the car was underpowered, overpriced, and prone to reliability issues. There were three different Lotus models, designated the 501, 502, 503, and could be ordered with varying levels of equipment and trim. The model 504 included the addition of automatic transmission, which became available in 1976, to the specification of the 503 as an optional extra. Options for the top-of-the-range 503 were air conditioning, power steering, heated rear window, and stereo cassette radio. An optional higher final drive gear ratio was well received by the market. On the road, the car was comfortable, quiet, had good traction, and exceptional levels of roadholding. The Type 75 sports car had a glass reinforced plastic (GRP) body made in two halves, which were joined along the waistline, and masked by protective rubber strips running the length of the car. The wedge shaped style reflected the 1970's perception of sleek, modern styling. Like its predecessors, it had an extremely low drag coefficient of 0.3. It had four wheel independent suspension using coil springs, used rack and pinion steering, had an anti roll bar, and 9 inch brakes, discs at the front and drums at the rear. It had wide doors, and both front and rear seats were comfortable. Like the Mark 1 version, the Elite was regarded as one of the best handling production cars in the world. It was arguably even better than a Porsche, and almost as good as a Ferrari Dino. Although designated a Grand Tourer, it developed insufficient torque to provide effortless performance. It had powered steering, but was prone to understeer. Because of its high price, it experienced difficulty in selling since, for only a little more, a Porsche 911 could be bagged. In terms of Lotus models, the Mark 2 Elite Type 75 is still in demand on the second hand market. 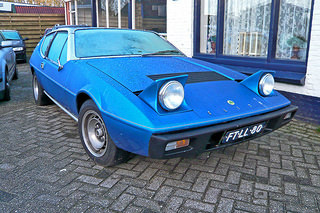 In fact, as a used Lotus, it can sell for anything from £5,000 to £17,000. In 1980, the Elite received a galvanised chassis, and a power bulge on the bonnet, which heralded the introduction of the 2.2 litre version of the 907 engine, now designated the 912.